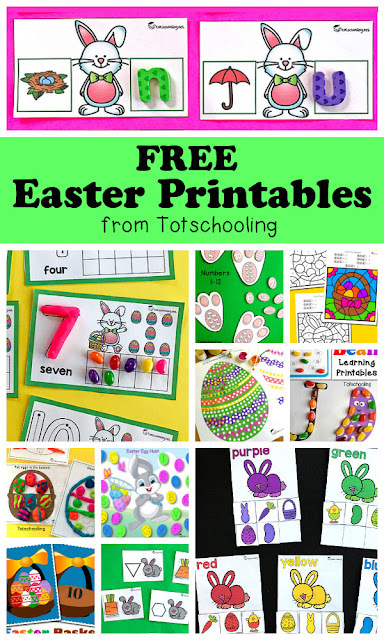 Easter time is the perfect time to learn with bunnies and eggs! 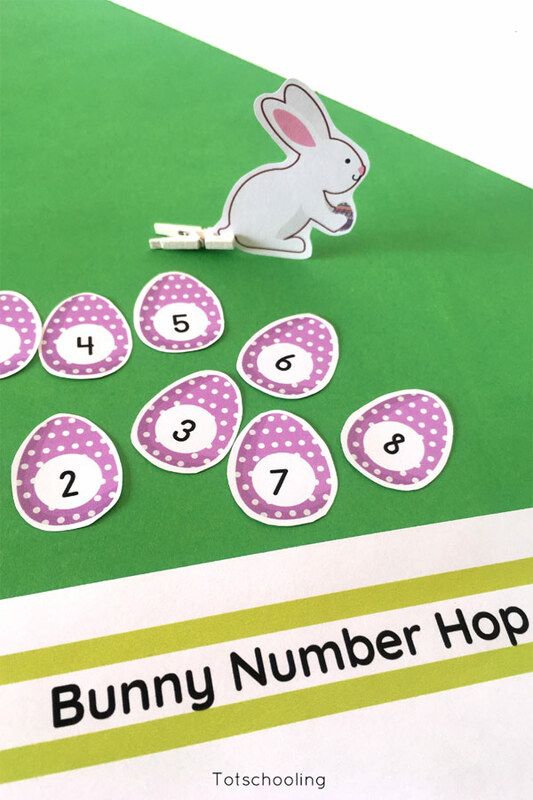 Use this free bunny number hop to develop number sense, number recognition, counting and ordering of numbers, just to name a few fun learning possibilities! This bunny is not just cute (but how cute is he? ), but very clever too! 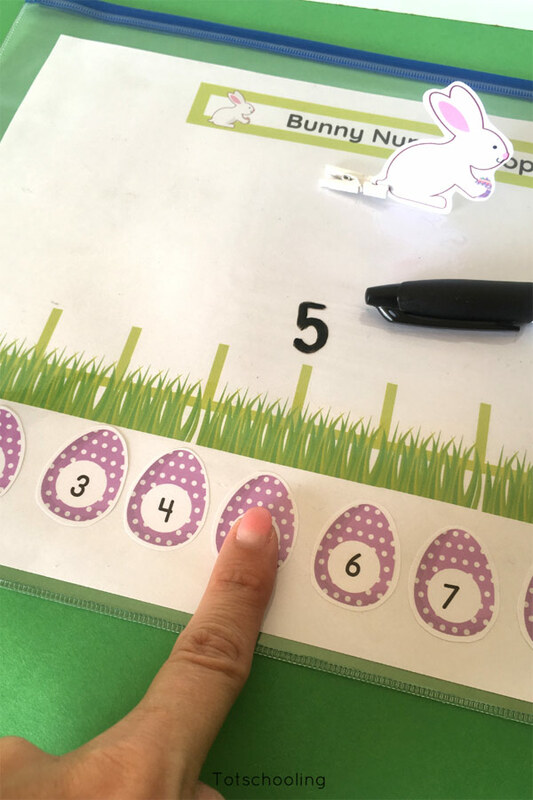 He knows how to hop from one number to the next, name the numbers and count them too! 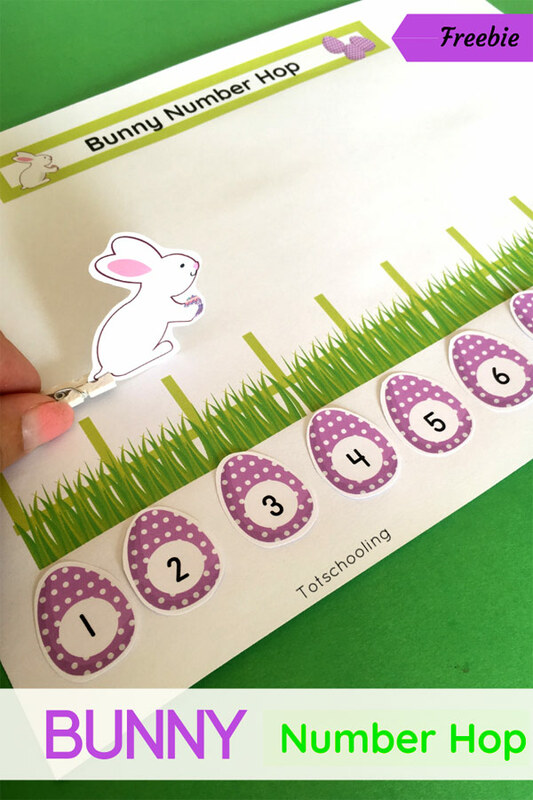 Print out the sheets in color and laminate if you wish (you can print the eggs and bunny on cardboard and use a dry-erase pocket too). Then, cut the eggs and the bunny out. 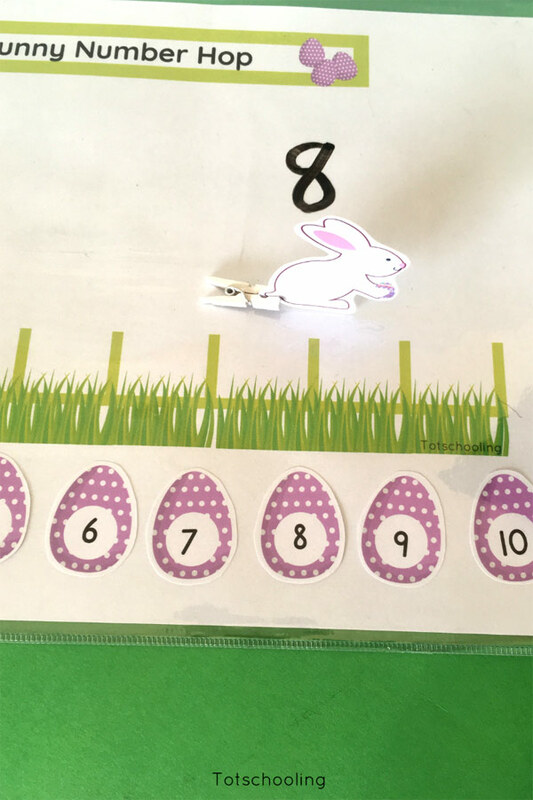 Attach a small peg to the bunny to make the bunny stand up and to easily move the bunny between the numbers. The very first thing is to order the numbered eggs. (The age and ability of the child will determine if this is an independent activity or not. ) After that, count the eggs. You can count forward and backwards too! 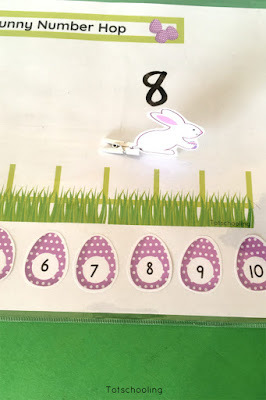 Writing the numbers- let the bunny jump onto a number and the child can write the number above the marker. This can be done in order or just randomly. If you have a dice that shows numbers up to 10, you can use that as well. Missing number- Cover a number and ask the child which number is missing and write it down. If he/she is struggling to do this, count with the bunny to find the answer! Lastly, do sums! 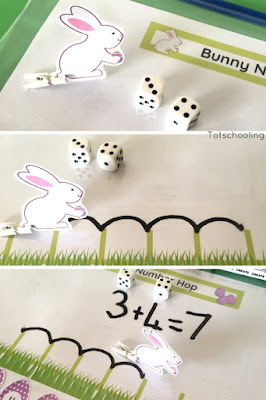 Add (or subtract) numbers using two dice. 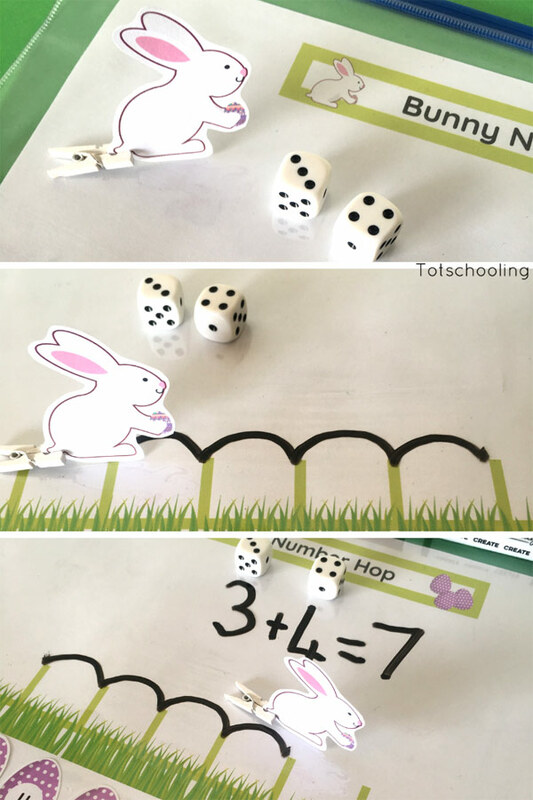 Throw the dice and use that to determine the numbers to use. Write the number sum down, draw the "jumping" lines and use the bunny to hop too! 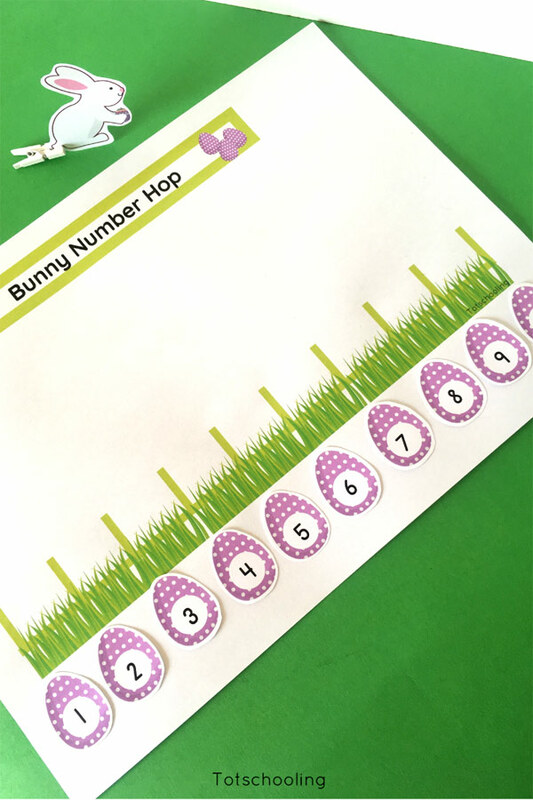 Such a fun number hop activity for little ones to develop number sense with the help of a cute bunny friend!